Say hello to your 2016 smartphone. 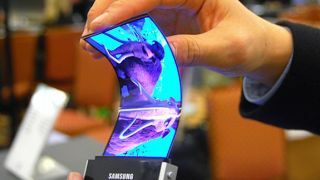 We've been promised bendable and foldable screens for several years now, but a new report coming out of South Korea suggests they might finally be close to becoming a reality. "The industry believes that the commercialisation of foldable smartphones will be possible in 2016," a Samsung official told Business Korea, in a rather matter-of-fact way. In just 12 months you could be rolling up your smartphone to put in your pocket. That's a claim we've heard more than once in the past, but as new smartphones such as the LG G Flex 2 and Samsung S6 Edge prove, the technology is now more viable than ever. The same report also provides an update on transparent displays. The technology is already used in planes, luxury cars and state-of-the-art billboards, and is on its way to smartphones and tablets too. "The development of display technology that creates a virtual space on glass is already completed, and even a promotional prototype is available," a senior LG official is quoted as saying. "However, it will take time until the product becomes commercialized due to mass production according to demand and stable supply." The idea of being able to fold up a tablet sounds more interesting to us than seeing the pavement while we walk along texting, but both technologies are worth keeping tabs on - they're in line to offer something really out-of-the-ordinary in the flagships of 2016 and beyond.